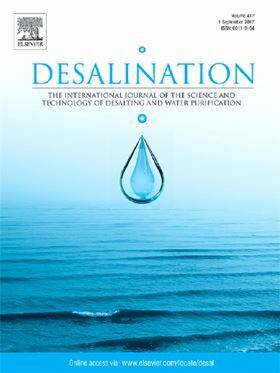 The research article 'Periodic electrolysis technique for in situ fouling control and removal with low-pressure membrane filtration' has been published in Elsevier journal Desalination. Electrically conductive membranes and their application for desalination pre-treatment and water purification have an exceptional performance due to self-cleaning of fouling deposits by the application of external electric fields. However, the effectiveness of existing conductive membranes is hampered by their common applications. The current approach aims to better understand the in situ fouling mitigation and enhanced flux by employing two different electrically conductive coated feed spacer configurations during filtration of humic acid at concentrations of 8, 12, 16 and 20 ppm. Periodic electrolysis was applied for a duration of 2 min with three intervals of 30, 45 and 60 min. A comparison of both the feed spacers was made in terms of the effect of the applied potential and interval time on enhancement of water flux, as well as the required energy consumption at four different concentrations. In terms of enhanced flux and energy consumption, feed spacer A (2 × 2 mm aperture size) revealed better results than feed spacer B (3 × 2 mm), which may be attributed to a greater conductive area. The reported technique shows a major advantage of in situfeed spacer self-cleaning, thus providing a continuous and non-destructive approach for the mitigation of surface fouling. A hybrid electrocoagulation-filtration prototype for the removal of fluoride, iron, arsenic and microorganisms from drinking water. For removing oil from oily water membrane filtration offers energy efficiency, easy processing and low maintenance cost. Dynamic membranes are a promising technology for the removal of low-density, non-degradable micro-particles such as plastics.